금곡사에 세워져 있는 탑으로, 1단의 기단(基壇) 위에 3층의 탑신(塔身)을 올린 모습이나, 기단과 탑신의 여러 군데가 갈라지거나 떨어져 나간 상태이다. 기단은 네 모서리에 두터운 기둥을 세우고, 그 사이마다 판돌을 끼워 두었는데 그 중 한 면에는 판돌이 없이 작은 돌들로 채워져 있다. 이렇게 모서리기둥을 본떠 새기지 않고, 직접 세운 것은 부여 정림사지 오층석탑(국보 제9호)에서도 볼 수 있다. 탑신의 1층 몸돌은 각 면마다 감실(龕室)을 팠는데, 목탑에서의 감실은 불상을 모셔두는 곳으로 들어갈 수 있는 공간이었으나, 석탑에서는 이처럼 형식적인 조각만 하게 된다. 두툼한 지붕돌에는 급한 경사가 흐르고, 밑면에는 6단씩의 받침을 두어 장중한 분위기를 연출하고 있다. 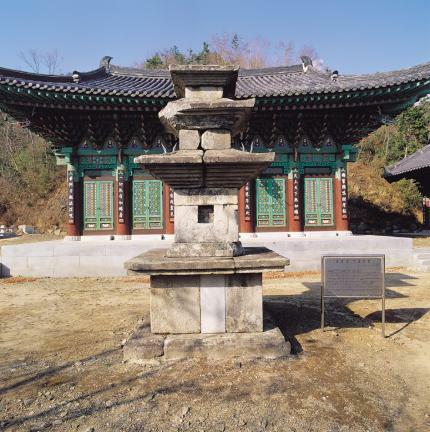 Three km along the way from Gangjin to Jakcheon, one can see Bipasan Mountain, with Geumgoksa Temple located at the middle of it. 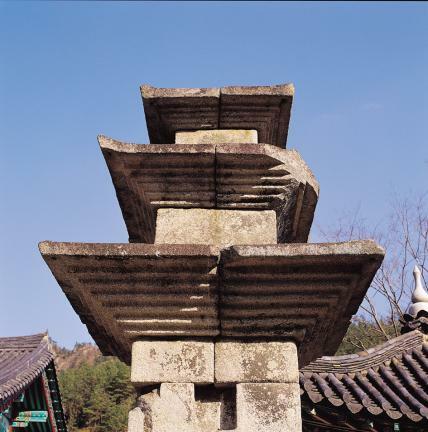 This pagoda consists of a single-story stylobate and a three-story main part. It has lost its finial decoration and several pieces from the stylobate and the main part. 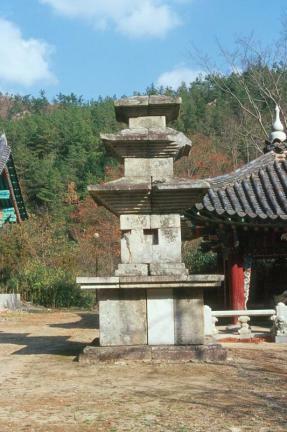 The stylobate is made up with four pillars at the edge with a flat stone between the pillars. 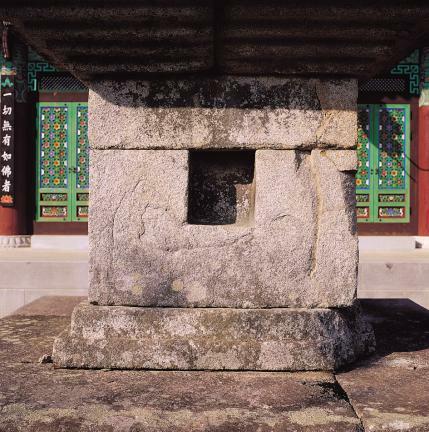 In particular, one side is filled with small stones without a flat stone. 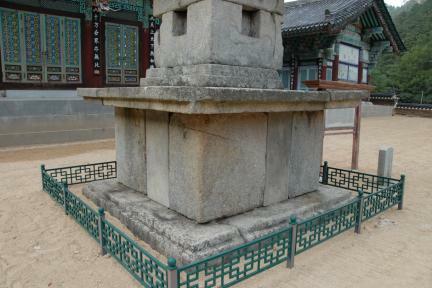 The method of construction of the corner-pillars being erected without a pattern engraved on them can be seen in the Five-story Stone Pagoda at Jeongnimsa Temple Site, Buyeo (National Treasure No. 9). 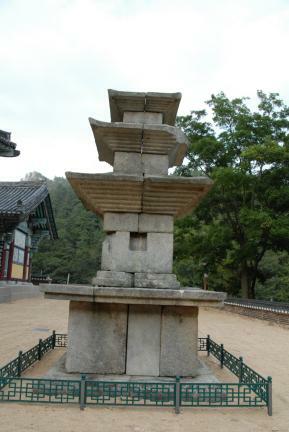 The first story of the main stone of the pagoda has a shrine on each face. 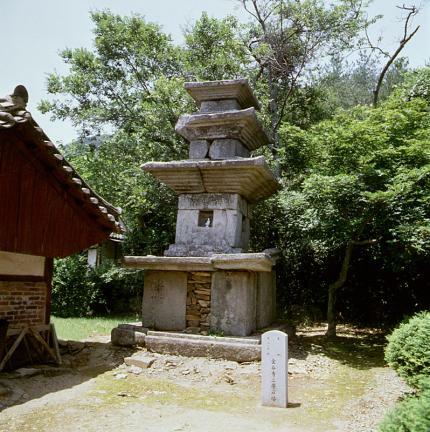 In contrast a wooden structure where the shrine functions as a place to enter and house an image of the Buddha, the shrine serves as a mere decoration in a stone construction. 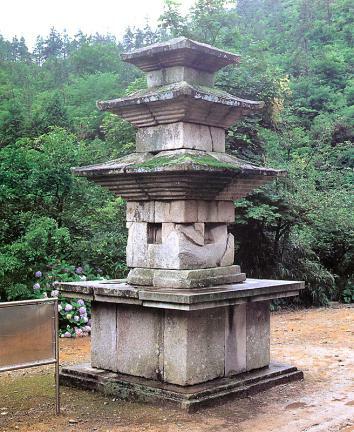 This pagoda is outstanding in that it reveals a stable ratio as it narrows up to the third story of the body stone, and that it is well structured at every point. 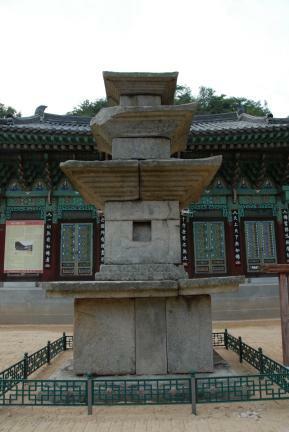 Built in the Goryeo Dynasty, the pagoda still retains some aspects of the Baekje Dynasty style. 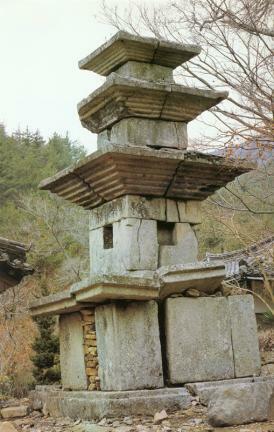 The deterioration of the pagoda points up the urgency of keeping and protecting our cultural assets.